Western blot of 6*His-tagged fusion protein with anti-6*HIS tag (66005-1-Ig) at various dilutions. 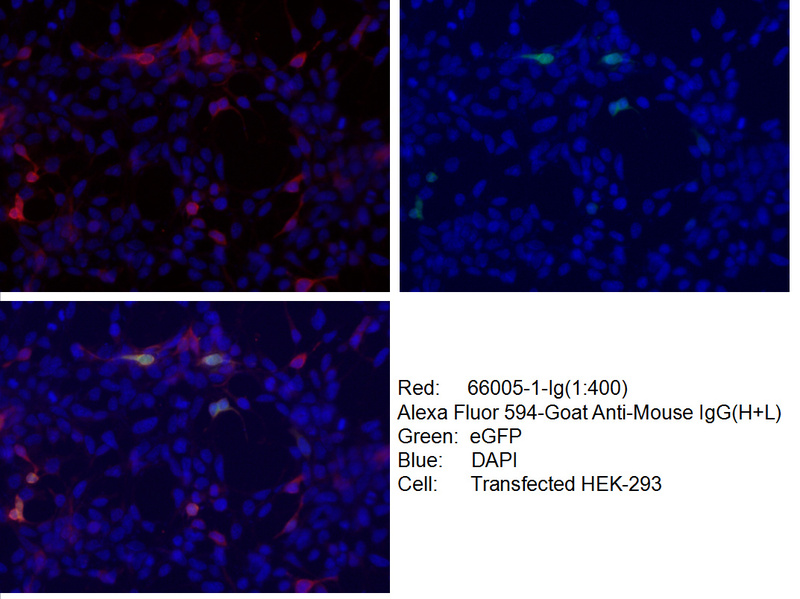 IP Result of anti-6*His, His-Tag (IP:66005-1-Ig, 7ug; Detection:66005-1-Ig 1:10000) with Transfected HEK-293 cells lysate 300ug. Protein tags are protein or peptide sequences located either on the C- or N- terminal of the target protein, which facilitates one or several of the following characteristics: solubility, detection, purification, localization and expression. 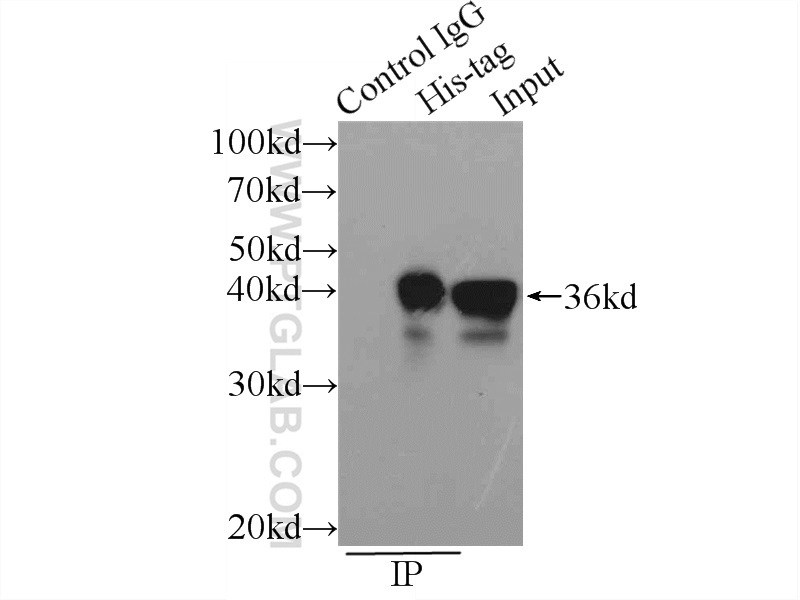 His-tag is often used for affinity purification and binding assays. Expressed His-tagged proteins can be purified and detected easily because the string of histidine residues binds to several types of immobilized metal ions, including nickel, cobalt and copper, under specific buffer conditions. The His-tag antibody is a useful tool for monitoring of the His-tagged proteins, and recognizes His-tags placed at N-terminal, C-terminal, and internal regions of fusion proteins expressed in bacteria, insect, and mammalian cells. Enhanced protective immune response to PCV2 subunit vaccine by co-administration of recombinant porcine IFN-γ in mice. TCTP increases stability of hypoxia-inducible factor 1α by interaction with and degradation of the tumour suppressor VHL. Cloning, expression, and characterization of iron superoxide dismutase in Sonneratia alba, a highly salt tolerant mangrove tree. Transcriptional regulation and characteristics of a novel N-acetylmuramoyl-L-alanine amidase gene involved in Bacillus thuringiensis mother cell lysis. CPK3-phosphorylated RhoGDI1 is essential in the development of Arabidopsis seedlings and leaf epidermal cells. Methods for detecting ATP hydrolysis and nucleic acid unwinding of Japanese encephalitis virus NS3 helicase.